This rock opera/song cycle/post-ironic parable by The Cubby Creatures tells the story of Jojo Hero who endures a childhood strewn with insults and comes to a startling conclusion, which behooves him to flee his village in search of answers. 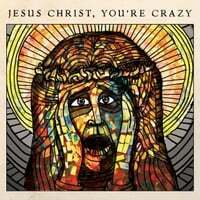 Jesus Christ, You’re Crazy brings together new original music by The Cubby Creatures with a “post-ironic parable” narrated by S.F.-based author K.M. Soehnlein, rounded out by ambient pieces by S.F.-based musicians That Hideous Strength, Squelchy, Snitch, Jason Gonzales, and Alec Way. Jesus Christ, You're Crazy was first conceived by Jol Devitro, then developed by The Cubby Creatures and expanded into story form by K.M. Soehnlein, and finally brought to its current state by Brian Weaver, Bill Fisher, Jason Gonzales, and Alissa Mach. The Cubby Creatures in this, their last incarnation, were Bill Fisher, Brian Weaver, Emily Davis, and Jason Gonzales. The Songs were written by The Cubby Creatures (except “Life Is Insane,” which was written by Jol Devitro and The Cubby Creatures, and “Keep in Mind,” which was written by K.M. Soehnlein and The Cubby Creatures), recorded by Bill Fisher, and mixed and mastered by Bill Fisher at Rodent Records (now Light Rail Studios) in San Francisco and at Harlan Street Studios in Oakland. Benjamin Tinker recorded the narration at the Magic Shop in South San Francisco. Additional overdubs were recorded at Bill and Lorna's house in Richmond Annex. Additional mastering was conducted by Jason Gonzales at the SoAr Song Shack in San Francisco. The instrumental ambient pieces were composed and recorded individually by their corresponding creators: That Hideous Strength, Squelchy, Snitch, Jason Gonzales, and Alec Way. Cover art (Blue Whale) by Alissa Mach. Inside panels by Doug Welch (Jesus Christ, You're Crazy), Jorge Heredia (Life Is Insane), Trismegista Taylor (Keep In Mind), and Billy Janes (Resurrection Pits). Art direction by Alissa Mach.